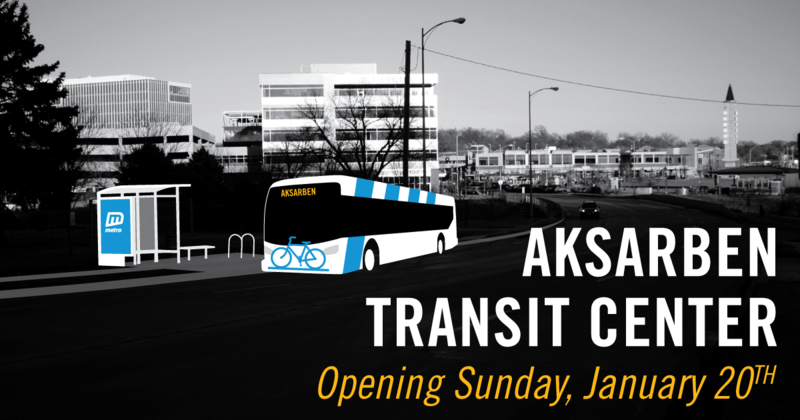 January 20, 2019 – This Sunday, Metro will open the Aksarben Transit Center at 68th & Mercy Road. The new location will replace the Bergan Mercy Transit Center and offer riders better connections to destinations such as Aksarben Village, College of Saint Mary, the University of Nebraska at Omaha, Stinson Park, and the Keystone Trail. In recent years, the area has become a growing center for major employers such as Pacific Life, Blue Cross and Blue Shield of Nebraska, and the recently opened HDR global headquarters that has brought nearly 1,000 commuters to the area. Bus routes from all directions will now give employees new options for their daily commute. The new transit center will also provide better access for college students headed to and from class. The MavRide program, now in its eighth year, has provided more than 600,000 bus rides to students, faculty, and staff. College of Saint Mary also initiated a pass program in the fall of 2018 to improve access to campus, especially for those without a vehicle. The Aksarben Transit Center will feature upgraded bus shelters, benches, and bike racks. The move will shift connection points for Routes 11, 13, 15, 18, and 55, which will improve timing and reliability for riders. CHI Health Creighton University Medical Center – Bergan Mercy will continue to be served by Routes 15 and 55.